Lakeshore owners have a strong affinity for and love of the lake where they live. This often translates into advocacy and action for preserving, protecting and improving the lake environment – a good thing. Unfortunately, this may also viewed as an indication that lakeshore owners really think it is ‘their’ lake. Or even worse, many think lakeshore owners want and expect ‘their’ lake to become their ‘private’ lake. I say ‘their lake’ because most lakeshore owners say this, not in the sense they actually own it, rather in the sense that they take ownership in the welfare of the lake. The position of the Lake Minnetonka Association is that Lake Minnetonka is a public resource for all to enjoy. Lake Minnetonka, as well as many lakes in Minnesota, benefit from lakeshore owners’ sense of ownership because lakeshore owners make significant investments in protecting and managing ‘their’ lakes. Lakeshore owners welcome others’ use and enjoyment of Lake Minnetonka, but they also expect the same high level of caring and stewardship from visitors as lakeshore owners themselves. Unfortunately, fingers often point both ways. Lake visitors point to shoreland modification, excessive weed and aquatic plant removal and large docks. Lakeshore owners point to excessive noise and speed, introduction of exotic species and sometimes rude or obnoxious behavior. Certainly, improvements can be made on both sides, but let us not forget Lake Minnetonka belongs to us all and its care ought to be borne by us all. 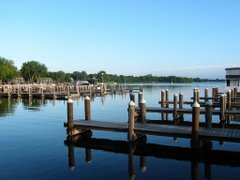 The Lake Minnetonka Association, on behalf of lakeshore owners, has been an unapologetic advocate for the highest level of protection and management for Lake Minnetonka. We believe aquatic invasive species (AIS) have harmed the lake and additional AIS will add to the damage. It is a reality that when AIS are introduced into a lake, it is there forever. From lakeshore owners’ perspective, AIS are brought to the lake from a visitor who can come and go, but the impacts are seen and experienced every day by lakeshore residents. From a lake users’ perspective, suggestions to control or restrict their access to minimize the threat of an AIS introduction is seen as a way to keep them out. While neither view is totally accurate, these opposing views work to keep us from addressing the underlying problems. We must all work to see the others’ perspectives, understand the damage AIS is doing to our lakes and work to solve this huge challenge. Unfortunately, AIS exploit the way we move from lake-to-lake, and visitors move between lakes much more then lakeshore residents. So, the movement must be addressed to materially address the concern of AIS. The better we understand and appreciate everybody’s concern for and love of this lake, and the more effort we put into finding common ground, the better, more lasting solutions will be forthcoming. Let us (all of us) start by referring to Lake Minnetonka is ‘our’ lake – as it belongs to all of us. Then, let us think of solutions that involve all of us.